Phragmites is an invasive plant that poses a serious threat to our local environment. It has invaded our beaches and our wetlands. If left unchecked, it will cause serious damage to the biodiversity of our area. 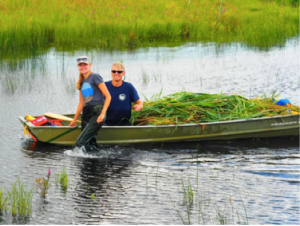 It out-competes native wetland plant species, creating a monoculture that compromises desirable habitat for wildlife. This is the third year that we are cutting and removing phragmites from our most sensitive areas, including wetlands. We have made a real impact and we are winning the battle! The Watershed Trust is undertaking this initiative in collaboration with the Nottawasaga Valley Conservation Authority (NVCA) and other partners. Come out for an hour, for lunch, or for the whole day. All ages are welcome – bring the kids or grandkids – but please come! Wear clothing and sturdy footwear that you don’t mind getting wet. Please also bring a hat, sunscreen, and water. If possible, bring pruners and gloves. Thanks for your interest. Click here to sign up, RSVP or talk to our Phrag organizer Vicky Boyd.